Biological Systems Engineering welcomes Troy Runge, PhD, as our next Chair, effective January 1st, 2018. 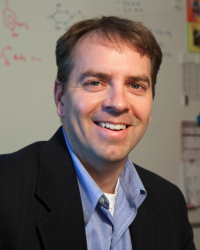 Dr. Runge is currently an associate professor and has been at BSE since 2009, teaching in the food and bioprocessing systems areas. He started at the University work as the Director of the Wisconsin Bioenergy Initiative, and still performs most of his research work in the biofuels and natural products areas. Prior to working at the University of Wisconsin, Troy held research and engineering leadership roles at the Kimberly-Clark Corporation in Neenah, WI. Much of Troy’s family is also part of the campus with his wife Kristin working at UW Extension at Center for Community & Economic Development and his daughter Elizabeth a sophomore on campus. William (17) is a junior in high school, but is of course facing immense pressure to also be a Badger. Please stop and welcome Troy to his new role or drop him a line at trunge@wisc.edu. We look forward to having Dr. Runge bring his talents, energy and vision to our department!